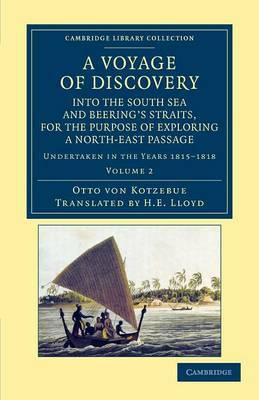 Author(s) Kotzebue, Otto von; Lloyd, H. E.
An admirer of Captain Cook, Otto von Kotzebue (1787-1846) was a leading navigator, in Russian service, circumnavigating the globe three times. His 1815 expedition set out to find a passage through the Arctic, study the coastlines of Kamchatka and Alaska, and explore the Pacific. Among the personnel were the naturalist Chamisso and the artist Choris, who both contributed valuable information to the published account, while Eschscholtz, a physician, collected zoological specimens. Originally published in 1821 in Russian and German, this English translation, presented with many plates and charts, appeared the same year and formed part of Darwin's library aboard the Beagle. Volume 2 contains the concluding part of the journal, together with contributions by the other members of the expedition. Chamisso's chapters on the Pacific languages are still of interest today, with his glossaries including words not given in any other contemporary sources.